← The Pembroke Players Garden Party 2014: Tickets now on sale! Add another event to your May Week diary! 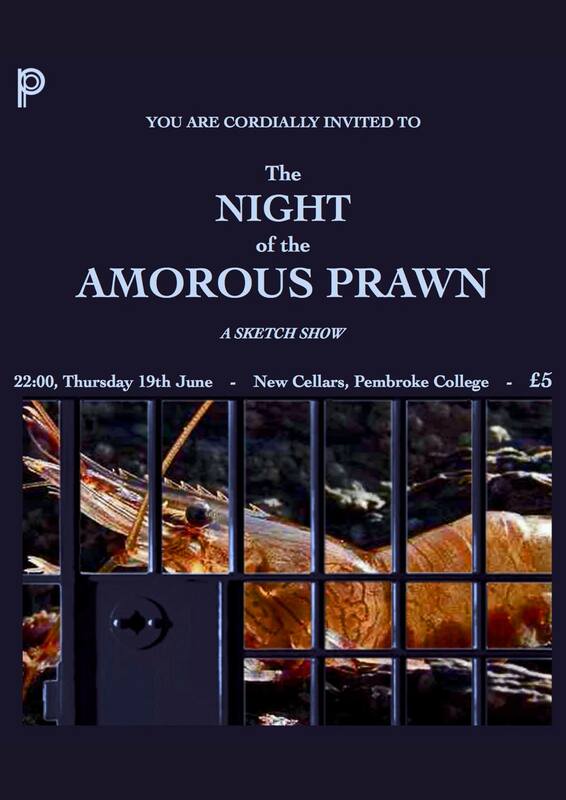 On Thursday night, just as things are quieting down elsewhere, in Pembroke’s New Cellars a brigade of sketch comedy talent will hot the night back up again, with Pembroke Players’ new sketch night – THE NIGHT OF THE AMOROUS PRAWN. Footlights irregulars Robert Oldham, Thomas Fairbairn, Robert Eyers, Patrick Brooks, Natasha Cutler, Jamie Armitage and Orlando Gibbs bring an hour of fresh hilarity in (possibly) the last comedy event this term. Tickets are £5, and available on the door. After the overwhelming success of our Golden Gods Smoker, we are initiating a free ticket reservation system. To be guaranteed a seat, simply sign up using the link below. Still pay on the door, but if your name’s on the list you definitely won’t be turned away. Be there. It’ll be amazing.